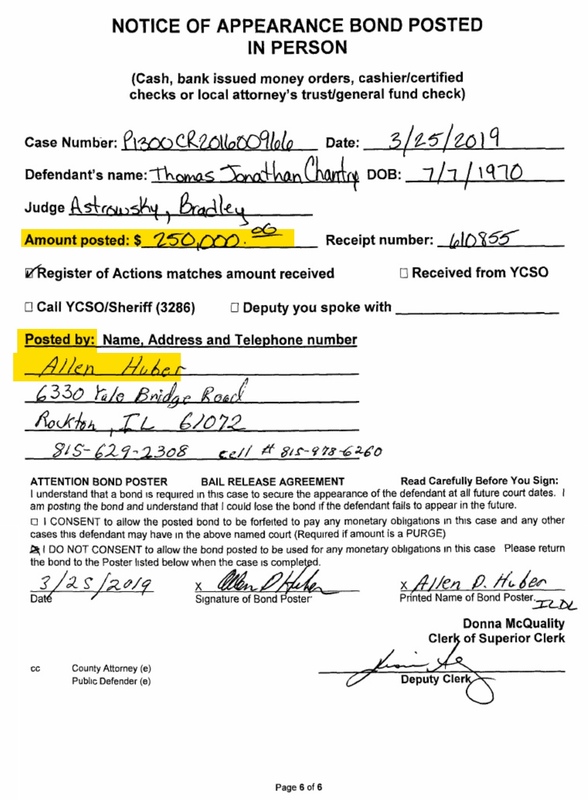 ARBCA Pastor Al Huber has posted $250,000 to spring his son-in-law, Tom Chantry from jail. 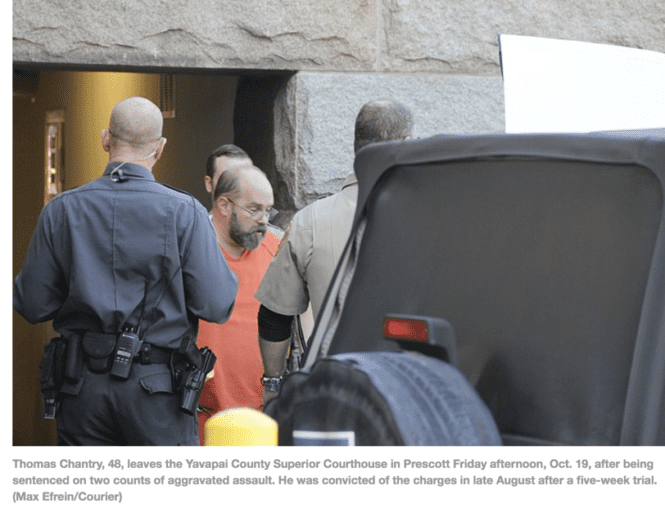 Convicted felon Tom Chantry has been incarcerated since September 10, 2018 in the Yavapai County jail as he awaits two trials. The first trial is scheduled to begin April 23, 2019 and is a retrial on 4 counts of molestation of a child. You can read more about these charges here. 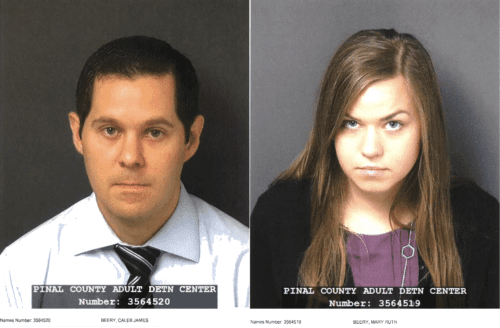 Chantry faces a new trial in which he has been indicted on nine counts of child abuse, sexual molestation of a minor, and assault. I do not believe a date has yet been set for this trial. You can read more about these new charges here. I attended the entire trial of Thomas Chantry. I witnessed first-hand the anguish of the victims, the anger of their parents and the heartache of all who were affected by the heinous actions of Chantry. It is hard for me to believe that anyone who sat through the trial can believe that Chantry is innocent of the charges. 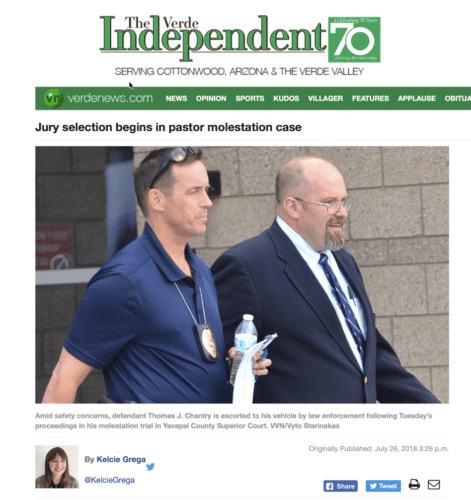 Yet, apparently, ARBCA pastor Al Huber still believes convicted felon Thomas Chantry is an innocent man! He is entitled to his beliefs, but one must wonder how anyone continues to attend a church pastored by such a man! I am praying justice is done in this case. 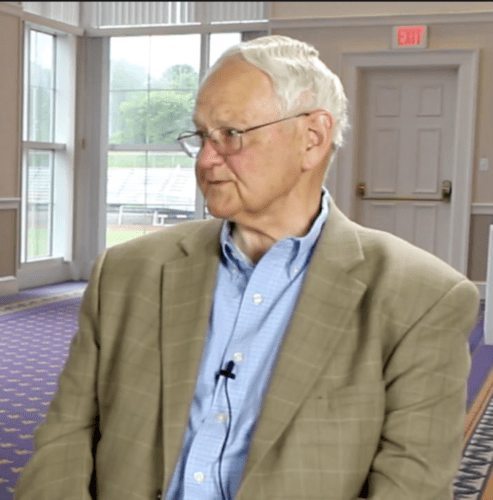 I am hoping Chantry’s own words – “I have done something I can’t recover from” are prophetic. If they are, Chantry is now enjoying his last month of freedom. ← Chalk Another ARBCA Resignation Up to Tom Chantry! At this rate TC will be out and vying to be the Great Wizard of Oz. Then along comes the Scarecrow, Al Huber, searching for a brain with the Tin man, Dale Smith, needing a heart. All the while the Munchkins observe the proceedings and continue to hide in the forest and worship the Wizard. Some jurisdictions allow you to post a percentage of the bond amount to secure a defendant’s freedom. That my be the case here – I don’t know what the Rules of Criminal Procedure are in Arizona. In most all jurisdictions, if the family pays a percentage of the bond to a Bondsman, he or she will sign for the remaining amount, guaranteeing that they (the Bondsman) are responsible to forfeit the bail to the court if the defendant fails to show for any court ordered appearances. Some states also allow you to put up real estate as surety for a defendant’s release – imagine that, putting your house on the line for a friend or relative who’s been accused of a crime. Doesn’t happen very often, but I’ve seen it. Thanks, putting up your home as surety for a friend’s release looks impressive. However, the reality appears to be that the government seldom seizes homes in such cases. From a bureaucratic and legal perspective, it appears to be difficult for the government to go after non-cash collateral, put up as surety by anyone, in general. 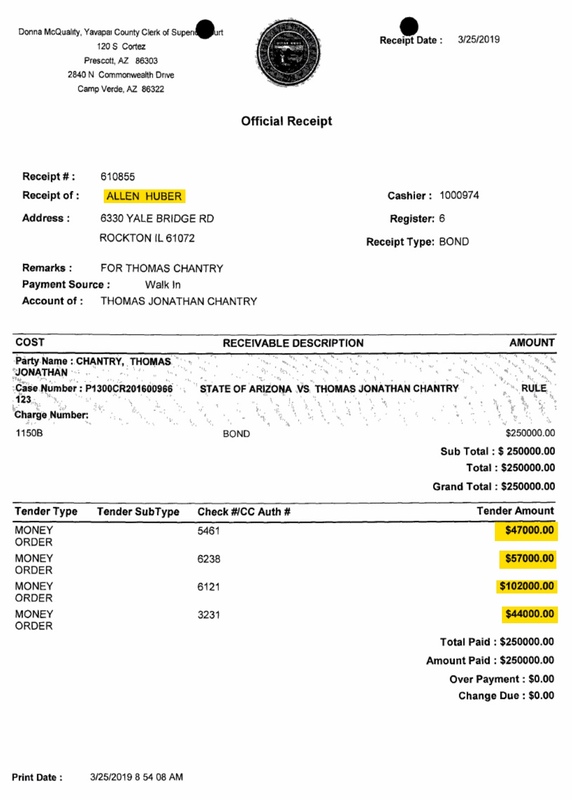 To my knowledge, Tom Chantry’s most recent bail bond condition was for $250,000 in cash. That sum was covered by 4 separate cashier’s checks, which are the equivalent of cash. Al Huber, Tom Chantry’s father-in-law, signed the official bail bond paperwork. It does not appear to be clear whether he covered the entire $250,000 bond, based in the publicly available information we have right now. I do think that Tom Chantry is a danger to the public. At the same time he has presumably behaved well in prison and has appeared at all his court hearings to date. Chantry also most recently surrendered himself prior to being formally served with an arrest warrant. I do understand the arguments in favor of lowering his bail bond amount from one million in cash to a quarter million in cash. I agree also that he seems to have shown up so far for his court appearances (and voluntarily, at that!) So, it seems unlikely that he would abscond, which was more than likely the reason for the bail reduction. Yes, I think that Chantry’s new lawyers argued to have his bail reduced. However, I went to the Yavapai Superior Court house in December to try and attend one of Tom Chantry’s hearings. The hearing was never opened to the public despite being listed on the court docket that day. At that time, I saw John Sears enter the building prior to the scheduled hearing time, which was at 8:30 AM, I believe. I’m also 85 percent sure I saw Tom Chantry himself open the door of a meeting room, attached to the courtroom, while I was sitting outside the courtroom. I know that a hearing occurred because I attempted to get the minutes for it a couple days later. They existed but hadn’t yet been scanned into the system according to the clerk I interacted with. It’s possible that John Sears was or is still assisting Tom Chantry’s new lawyers even though he has officially retired from the case. 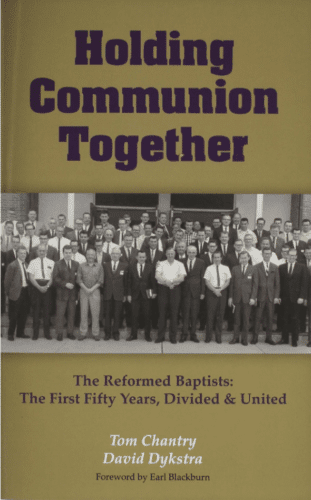 Fascinating that Walter Chantry’s book was the leverage to start a new church decades ago and now Walter Chantry’s real work, his son, Tom, is the cause of so many leaving the same group of churches. I am glad I lived long enough to see my doubts confirmed. Thanks for the comment, Pew Sitter. I find your statement – “Walter Chantry’s real work, his son, Tom,” – interesting. If you look at Tom as the real work of Walter Chantry it makes sense that Walter would write a letter attacking the elders of Miller Valley Baptist Church for having the audacity to take action against Tom. Also, considering it is Tom’s actions, (not his “pride” which he says led to the actions), which are under scrutiny and resulting in jail and more trials, one wonders at the point of Tom saying that pride led to the actions, and one wonders even more at Walt’s point in focusing on the sin of the congregation for looking into Tom’s pride issues. Another nice example of how religious talk just gets in the way. Its also another nice example of how leaders are not at a loss in offending and re-offending the faithful. You may be saying “Thou Art the Man!” along with Nathan, but so far The Man’s been beating the rap like an Author Self-Insert Mary Sue in bad fanfic. Very interesting. Can someone refresh my memory of how much jail time Chantry has served in all, so far? Todd, will you be attending this new retrial? I’d imagine it’s hard to make plans, as there’s no telling if it will be delayed again, and again. Also, I’m curious if his probation begins now that he’s out, or do the seven months he’s been sitting in jail count toward it? I suppose he won’t be able to even attend church, as during his probation period he’s not allowed to interact with children other than his own. I guess he won’t be able to go many places at all, since children are pretty much everywhere. I seem to remember, but am not sure, that he has three young boys. All I’ve got to say is lock up the kids, there’s a monster on the loose! I am uncertain whether Chantry’s time in Yavapai County jail counts toward his probation sentence, but the clock is definitely running now that he is out. Yes, Chantry has three boys. There is an interesting story about that. When I first began covering the Chantry story I had a photo of the family which included the three boys. Karen Chantry wrote to me and asked me to remove the photo as she did not think it was right to involve them in the story. Fair enough – her point was valid. Then, in their letter to Judge Astrowsky in which they attempted to get him to go easy on the sentencing of Chantry, she included several photos of the children. This letter and the photos are a matter of public record – I have them. I have not published them because I didn’t feel it was appropriate. I can only conclude that Karen is not really all that concerned about keeping her children out of the public eye! Thanks for answering, Todd. So the kids are off-limits and to be shielded from the public eye…until they’re not. Sounds a bit manipulative to me. But to be fair, if I had a husband whom I really believed to be innocent of these heinous crimes, I suppose I’d use everything, including the kitchen sink, in pleading for mercy for him. But how anyone, even his wife, believes in his innocence at this point is far beyond my understanding. The three-man team made a point of documenting that they all believed the children to be very credible and they had serious questions about Chantry’s side of the story. And now, all these years later, there’s just no possible motive those poor victims could have that would benefit them to continue lying. None. Anyway, now that he’s coming home, I hope Mrs. Chantry is shrewd as a serpent in keeping watch over them, because young, defenseless boys are exactly what his particular fetish is drawn to. Thanks, Elizabeth. By the way, someone just sent me a screenshot of Karen Chantry’s public major Facebook picture. It features her three children. I would agree that Karen Chantry could use any strategy for supporting her husband if she was not sanctimoniously claiming to be a good Christian wife. Bothering Todd about posting a picture with her children in it, while blasting their images all over the internet publicly for her purposes, says something about Mrs. Chantry’s integrity in my opinion. Unfortunately, Karen Chantry has little reason to monitor her children’s time with their father if she really believes he’s innocent. Under the terms of Tom Chantry’s bail/release prior to his first trial, he was only allowed to have supervised visits with his own children. To my knowledge, that suggests that a social worker or other government official has to be present during his visitation times with his own kids. 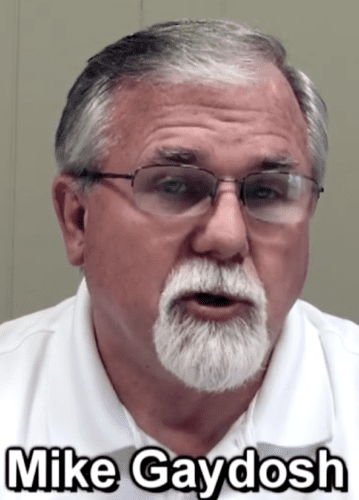 Since Tom Chantry is now a convicted felon awaiting trial(s) pertaining to many other charges pertaining to child abuse, I doubt that he is allowed to have unsupervised visits with any children. At this point, I’m accusing Karen Chantry of slander. I have read a letter she wrote to her friends and family claiming that Tom is innocent despite all the evidence presented at his trial, which would suggest otherwies. I think that Mrs. Chantry needs to explain why people are falsely accusing her husband of heinous crimes or quit suggesting that they’re all liars. If she wants to claim to be a Christian, then she should be mindful of bearing false witness against others, in my opinion. Tom is not allowed to have contact with children except his own. The only restriction placed on him with regards to his own children are that he not engage in corporal punishment or physical discipline with them. He does not require supervision to be with them. It doesn’t make any sense. How will anyone know what he does if he is left alone with them? Thanks for the information. Do you have a source I can reference? Thanks. I just received documentation about Tom Chantry’s most recent release terms. The wording is complex,so I’ll read it carefully before commenting further. Thanks, Janna. I agree with all your points. I, too, have read her letter claiming he has been falsely accused. You’re right. By claiming his innocence, she is certainly suggesting the victims are liars. I’d think she’d be more cautious posting those boys’ pictures around FB, simply because of what he’s accused of. It’s just creepy seeing any young boy under Chantry’s authority. Is there any way to get his church or ARBCA to have to reveal where that money is coming from? If they are both non-profit organizations and subject to the laws of the land, don’t people have a right to know and see that the money is not being taken from donations/offerings intended to go to the church for the work of the Gospel and not the work of supporting Chantry? I don’t care if this guy is a billionaire in his personal business life; the fact that he’s a pastor and spending this much money to bail out a child abuser a month before his trial raises some serious red flags and concerns and doesn’t show him to be above reproach as the Scriptures call him to be. Thanks for your comment Concerned Christian. I would assume the members of the ARBCA church where Al Huber is a pastor have a right to see the budget, but I really don’t think they would be foolish enough to funnel any money from the church donations to spring Chantry from jail. Huber owns a successful business which he mentions in his bio on the church website. (The bio is included at the end of this article.) I would like to know how much money Huber has spent so far on legal fees for the defense of Chantry. I would venture a guess that it has been hundreds of thousands of dollars. As you may have noticed, there were four money orders totaling $250,000 to pay the bond. I would be interested in knowing if those 4 money orders were all paid from Al Huber’s funds, or, and this is just speculation on my part, were there three other donors? I hope to find out. As I mentioned on my Twitter account, if Al Huber truly believes Chantry is innocent it raises some valid questions concerning his discernment. He sat through the entire trial, just as I did. I would never attend a church pastored by such a man. 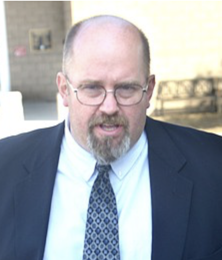 I should also mention that Dale Smith, the senior pastor of the Rockford church attended the trial as well. Make of that what you will. But yes, there are and have been some serious red flags raised. I agree. If money is being mis-spent by non-profit organizations, that is always a problem. I do believe that ARBCA has likely mis-used tax exempt funds in many ways. Unfortunately, it appears to be nearly impossible for the IRS to audit all religious organizations, not just Christian ones. There are established legal barriers to doing so, as well as the fact that people who mis-use funds for religious organizations are very quick to cry “religious persecution” if the government investigates them. I don’t have a solution to this problem. I just hope that people now avoid giving ARBCA money. TW and JLC, I had the very same questions about the 4 money orders. Are all they from Huber? Are they all from 1 particular account if they are? Are they from several donors? It would be really nice to get pressure on him from his congregation in order to get him to reveal these details to at least them. His personal money is his personal business but if he or any others are using church funds for this, it needs to be brought to light. I hope he’s not; every thought, word, and deed is under the eye of our Omnipotent God and be sure that he will have to give an account for every dollar he misspends on TC. I agree 100%. I also think that Al Huber’s church is entitled to ask him questions about the stewardship of his personal money given the level of involvement they appear to have in their members’ lives generally. Most father-in-laws would be disgusted by having a son-in-law such as Tom Chantry. Perhaps Huber could have seriously argued that Tom Chantry was completely innocent prior to the trial, yet that’s a very difficult thing to do now for the reasons Todd pointed out. I wish I could find the studies at this moment, but reputable organizations like Stanford university have estimated that only 1-7 percent of child sexual abuse allegations, which make are considered valid enough to result in formal legal proceedings, are false. Since Chantry appears to have multiple accusers, the chance that all of them are lying is a fraction of one percent arguably. His accusers are also putting themselves on the line, as perjury is a major crime. Many of Chantry’s supporters argued that he should be considered innocent until proven guilty. Now that he’s a convicted, violent felon they’re mute. Presumably now most of his supporters do think he’s guilty of at least a couple major crimes. I have not read her Facebook entries, yet I’m told that Mrs. Tom Chantry maintains that the accusations from reported victims are just designed to disgrace her husband. If so, why? Do Chantry’s accusers have some grand reason to conspire to maliciously destroy his life and reputation even though they think he’s innocent? To the point that they’ll perjure themselves and have to talk about personal issues, like sexual abuse, via questions from a hostile defense attorney? This “Tom is just being persecuted” argument doesn’t make sense to me. I doubt that Al Huber buys it either. 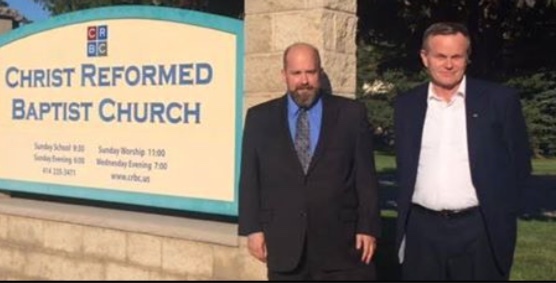 Therefore, perhaps it’s reasonable for Al Huber’s church to ask him why he’s so determined to help his son-in-law, who is now a convicted violent felon, make a $250,000 cash bail and likely pay for top-tier attorneys too. That doesn’t seem like a very Christian thing to do. His wife might think it’s some conspiracy, but Chantry had a bad reputation even while he was pastoring in Prescott. She passed away a few years ago. I wish she had told her story. It’s possible that the information you want is public record. Anyone can call the courthouse and ask. Alternately, the link above tells you how to report suspected fraud to the IRS. You don’t need proof or even solid evidence to do so. I’m pretty sure you can also report anonymously although I suspect that non anonymous reports are taken more seriously. You don’t need proof of fraud because there’s probably no way for the average citizen to know how ARBCA or any other non profit spends its money without illegally accessing its records. All we can do is pass concerns on to the relevant government authorities.